Tamatoa: Shiny... I'm so shiny... Didn't help me though, did it? Still upside down here. Just need a little push. Can we be real? If my name was Sebastian and I had a cool Jamaican accent... you'd totally help me. You would. You know you would. 5.2.2019 I’m so shiny… Didn’t help me though, did it? Moana: How do you get your tattoos? Maui: They show up. When I earn them. Moana: How'd you earn that one? What's that for? Maui: That's man's discovery of Nunya. 5.2.2019 That’s man’s discovery of Nunya. Maui: Listen... I... appreciate what you did down there. 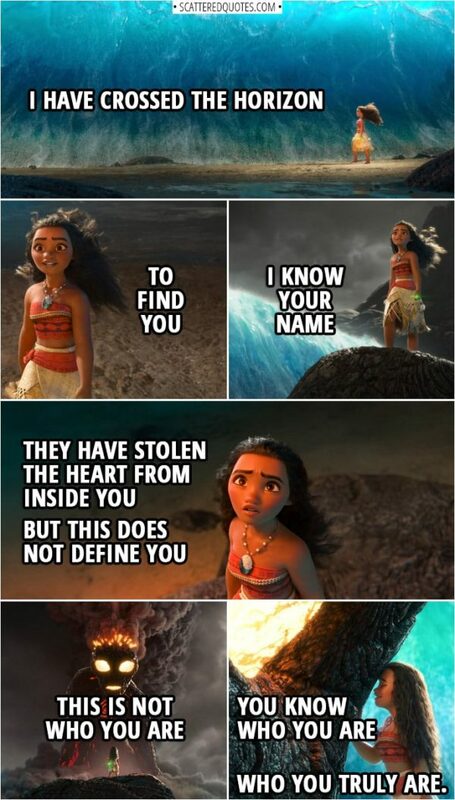 Maui: I'm sorry. I'm trying to be sincere for once, and it feels like you're distracted. 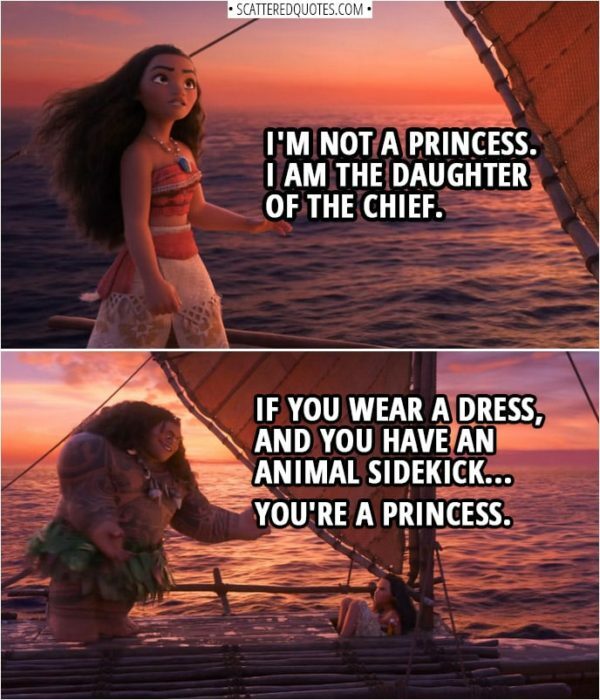 Moana: No, no. No way! Maui: Really? Because you're looking at me like I have a... shark head. 5.2.2019 You’re looking at me like I have a… shark head. Tamatoa (to Moana): You can't run from me! (Moana starts running) Oh, you can. You keep surprising me. 5.2.2019 You can’t run from me! Oh, you can. Tamatoa (to Moana): It's a sparkly, shiny... Wait a minute. Ugh! It's a human! What are you doing down here, in the realm of the mons... Just pick an eye, babe. I can't concentrate on what I'm saying if you keep... Yeah, pick one, pick one! Maui (about Tamatoa): Make him talk about himself. He loves bragging about how great he is. 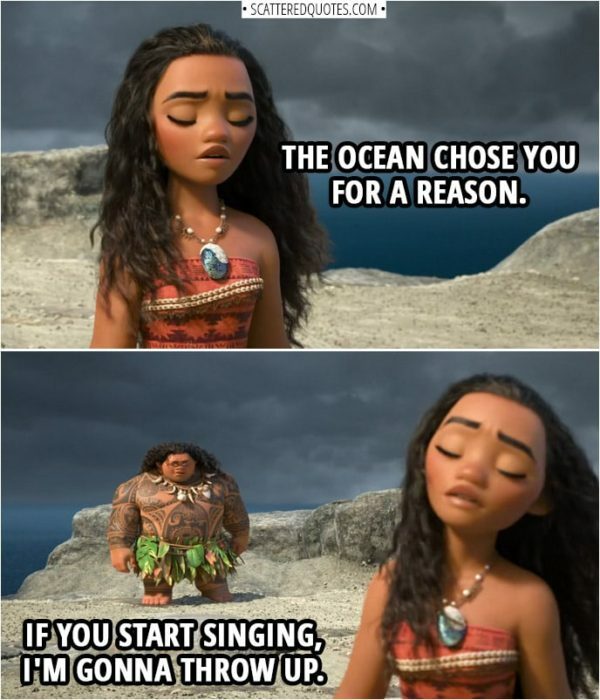 Moana: You two must get along swell. Maui: No, not since I ripped off his leg. 5.2.2019 Not since I ripped off his leg. 5.2.2019 If you start singing, I’m gonna throw up. Moana: We're going to the realm of monsters? Maui: We? No. Me. You are gonna stay here with the other chicken. 5.2.2019 You are gonna stay here with the other chicken. Maui: If the current's warm, you're going the right way. Moana: It's cold. Wait, it's getting warmer. (Maui smirks) Aah! That is disgusting! What is wrong with you? 5.2.2019 That is disgusting! What is wrong with you? 5.2.2019 You have an animal sidekick… you’re a princess. Maui (to Mini Maui): Oh, no, no, no. Don't look at me like that. It's a beautiful cave. She's gonna love it. 5.2.2019 It’s a beautiful cave. She’s gonna love it.